The oldies went to Germany for Christmas to spend time with Ben and Sonja and brought me back beer. Good oldies. This is a special beer from a village in Bavaria called Marktl. Marktl is the hometown of Pope Emperor Palpatine the Nazi Benedict. Being Bavarian they've brewed a beer in his honour. 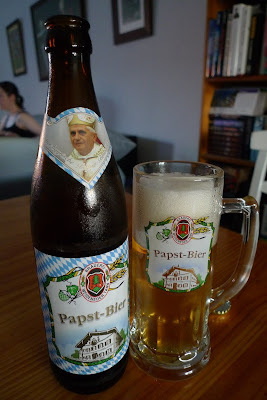 Good 'ol mum and dad brought me back a bottle of this holy water and a souvenir stein. Typical Bavarian Beer. Not the best from that part of the world but better than some. I didn't burst into flames when I drank it so it can't have been blessed. Papst Bier means Pope's beer by the way. I still haven't been able to source a souvenir Pope-on-a-rope though. Two weeks in... a life time to go.